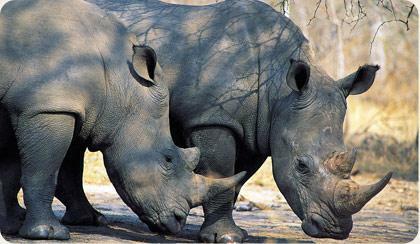 The Pilanesberg National Park covers some 55 000ha and is the fourth largest in southern Africa. The park is located on the eroded vestiges of a volcanic crater one of only three such craters in the world. It is here on the undulating hills and open savannahs; sightings of the 'Big Five', an abundance of wildlife and over 360 bird species can be enjoyed. 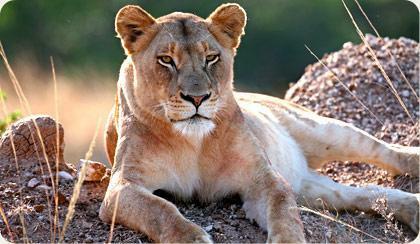 Close-up and personal encounters can be on bush walks and game drives accompanied by skilled field guides. The lodge uses a tracking system that allows various animals to be monitored. The data logged presents various options for locating the whereabouts of a specific species. All sources of information are used in the tracking of the animals, from ranger sightings and collared animals to park visitors’ sightings, creating an interactive community relationship between rangers and guests. The program further enhances the chances of spotting the game guests want to see, simply by highlighting a species past weeks’ movements and almost pinpointing an area in which to search, removing a rather large area of the 'hit or miss' phenomenon constantly plaguing tourists. Aside from game trails around the lodge, each individual luxury suite overlooks the centre of the horseshoe, around which the lodge is designed, a patch of untouched Africa, complete with a waterhole that incidentally, served as home to two hippos. The restaurant terrace also basks in view of the waterhole where visitors have been privileged enough to view the greatest of Africa's ‘Big Five’, the elephant.